Heritage breeds are the focus at Woodland, from French donkeys to Mulefoot and Hereford hogs. As with the garden, the livestock is raised as naturally as possible, without the use of steroids or stimulants. 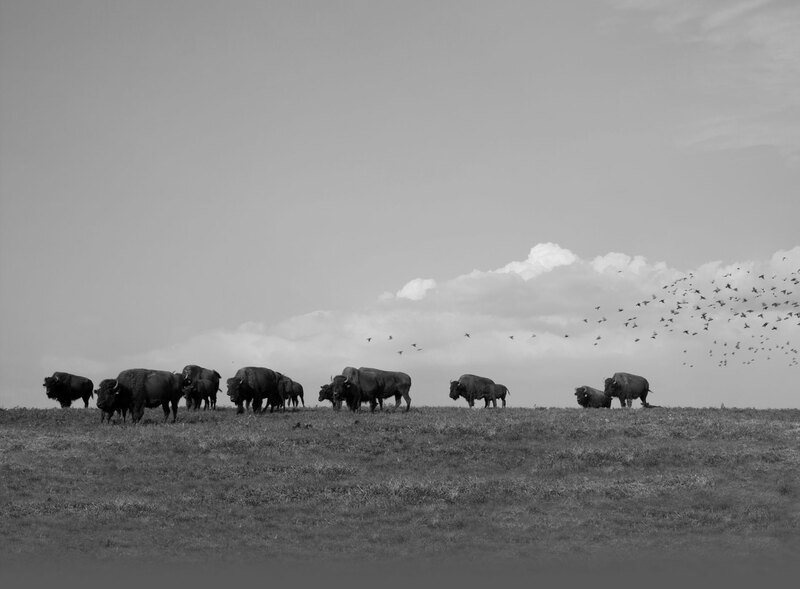 One of the highlights at Woodland is the large herd of Authentic American Bison. Kristopher Kelley, farm manager, raises the bison sustainably without steroids, stimulants, and sub-therapeutic antibiotics. The bison are processed at Woodland’s own USDA-approved facility. You can purchase bison meat from our Farm Store. You’ll find both black Mulefoot hogs and Hereford hogs in the large pastures at Woodland, not far from the banks of the Ohio River. The pig’s natural feed is grown on the farm as well. Heritage pork is available for sale at our Farm Store. Chickens are a relatively new addition to the farm. Chicks from Egyptian Fayoumi and other breeds arrived in the spring of 2011. Today they’re fully grown and busy producing the next generation of chicks, as well as fresh eggs for the farm house. Farm-fresh eggs are available for sale at our Farm Store. A dozen horses call Woodland home, including a team of carriage driving horses. These large, wonderfully smart animals share their pastures with rare French mules. Spurred by concern over colony collapse disorder, Woodland has added two types of beehives. The hives provide shelter for bees and fresh honey for the farm house. The farm is also home to many types of wildlife. Deer, foxes, rabbits, songbirds, blue herons and turkey vultures all inhabit the forests and open spaces at Woodland. A visit to the farm isn’t complete without saying hello to Ella, the “retired” livestock guard dog. Ashe, a rescue from Asheville, North Carolina, is a young dog who’s always eager to accompany visitors as they tour the farm. A friendly cat, Bobbie, lives in the horse barn.